i'm fairly sure some people have noticed but i'm not sure it's been explicitly stated. the image is changing without any need for refreshing. just people are talking about refreshing. It looks like it's designed to auto refresh. Also, there's been a ton of images, it's changing over time. Oh, he has just moved to the other side of the castle. Yes! I once had a 24-hour party at my apartment where we listened to this the whole time and people came and went for 24 hours. It was an amazing experience. If only today's comic were more like 9 Beet Stretch... like, if it were one slowly shifting image, like an animated video in super slow-mo. We'd all be glued to our monitors even more than we are now. This also reminds me of the game Braid -- in order to get one of the secret puzzle pieces (I think that's what it was? It's been a while since I played Braid), you have to stand on a cloud that appears not to be moving at all, but in fact is actually moving extremely slowly, and if you wait long enough (hours and hours) the cloud will transport you across to an area that is otherwise unreachable. What a fascinating idea! 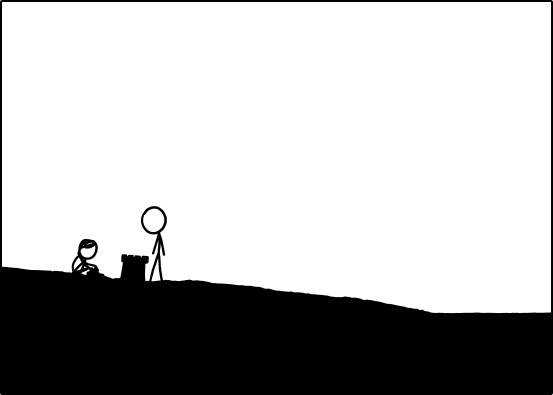 Randall is a genius for adapting this concept of sloooow change to xkcd. Davidy wrote: I think the joke here is the time all the programming/hacking geeks are spending trying to figure this out. All will be revealed 4/1/2013. So, sometimes before I go on vacation, I do extra work to get things ready and running in my absence. I get some stuff done early and set up, and then ignore them while I'm gone. What are the chances he's just on vacation at a beach? Maybe he spent a few hours (days?) last week planning a slowmotion slideshow of things he'd like to be doing at a beach, and let it loose on us while vacationing away? Maybe we shouldn't be gawking at his hard-earned break. Still waiting to see if the "tide" eventually comes in. "Time and tide wait for no man..."
I like the idea of Randall Munroe developing the story in response to what's going on here. I also like what it does to us, watching it unfold. I like how it makes 30 minutes feel long, and justified, and more precious. How it makes me wait for whatever's next, despite my instant gratification craving. I don't want the code-breaking to succeed, I don't want the comic to move faster, I don't want a happy ending. Heck, I'm not sure I want an ending at all. Randall, if the reader-participation theory is true, I'd like a kite to be flown there soon. Beaches like kites. It's kinda hard to tell, but the latest looks like she's sitting back with her head on her hand, like she's bored. I was going to write that this must be the very first story that is listened to, studied, forecasted, etc by so many people while it's unfolding but actually that's what soap series and feuilletons have been doing for ages. But it's definitely a first in many other aspects, like a new episode every 30 minutes. My forecast for the next 3 frames: she is now making something completely different while he is watching, he's still fine with the "normal" castle they where used to. People are wondering what they are saying, but I think all of what is going on can easily be enjoyed in utter silence. It's like they spontaneously participate in activities with each other. I'm betting this will be a "touching" comic, and will not have any wacky twist ending. Wow. A genuine mystery to solve. I already like this strip. So my guess is the strip is aiming for a deeper ending - it'll start building up to show something huge at the end, or just prepare the scene for some change in few last strips. As for the time - it very well may be months. I assume making next frame takes minute or two, starting from the previous one, so ten of them can be done in a short break. There might as well be two hundred ready and more to come. Someone suggested before that the strips are being written on-the-flight and change depending on the discussion on the forum. I know damn well how mind-twisting idea it is, but the problem is - it wouldn't match the theme of the strip. It's "Time". The name suggests no relation to change influenced by the meta-world. I assume the story is already set in stone. This, of course, doesn't mean all strips are written for it. It's just that I think the end is already decided and won't change. And I really think it's a long way before we learn it. There isn't much more we can do but sit back and watch it unfold. It doesn't make guessing it any less fun. pardon my french, but phloème toi (this was on principle). On the other hand, thanks for the lesson in grammar (and this is for actually writing a creative answer instead of just bashing at one's bad grammar). Those words are tricky. And yes, I've changed my swear words for words that I'm trying to learn. It has proven to be... Effective. 411 posts in less than a day, and over 650 people reading the thread. Is this breaking any XKCD records? Beatrice The Golden wrote: Wow. A genuine mystery to solve. I already like this strip. Everyone here's going to have to be vigilant and post each new frame as it comes, right up to the end. Us Brits aren't going to be able to keep monitoring the site much longer. Past our bedtimes. Nighty night, everybody. Let me know how it ends, please. Last edited by Nicad on Tue Mar 26, 2013 12:20 am UTC, edited 1 time in total. This is also the first comic ever to be reported about by major newspaper here http://www.nrc.nl/nieuws/2013/03/25/een ... aan-duren/ Any media picking it up in the US? davedrowsy wrote: This also reminds me of the game Braid -- in order to get one of the secret puzzle pieces (I think that's what it was? It's been a while since I played Braid), you have to stand on a cloud that appears not to be moving at all, but in fact is actually moving extremely slowly, and if you wait long enough (hours and hours) the cloud will transport you across to an area that is otherwise unreachable. And for those of you who haven't played Braid yet : go play it. Now. Very relevant to the subject of this comic anyway. Same in France as in Britain, but I don't expect to see the end when I wake up, just a dozen more frames. I think I'll just wait to the end and then find whoever has tracked the overall progression. For me, I just opened it, and it started with them sitting down, then jumped straight to Sandcastle. I would not be surprised if it is a 48 hour comic that will not be finished until his next scheduled post on Wednesday. Last edited by KroniK907 on Tue Mar 26, 2013 12:30 am UTC, edited 1 time in total. Nicad wrote: Well, I don't know about overall, but as far as the mind-bendingly huge ones go, yes. "Umwelt" only got to page 7 on the first day, and even "Click-and-Drag" only got to page 10. We're already on page 11. I think it's the mystery that keeps it so popular. It's not yet "that" great, but it still can be. I woke up from my sleep with the following realisation, and had to post it immediately; though I had started watching this strip with gloomy/morbid thoughts there is only one possible indication that this post is giving. Randall is about to become a father. I think this is his way of sharing the news. After the roller coaster ride of the past two years, they really waited for it and with time they got the happy news. Even the sandcastle would fit if now a small child's stick figure would join and play with the sandcastle. 4) Something random will not happen UNLESS the strip will actually stretch to 1.IV. I agree with all of these conjectures. This is a good list. I would add, in defense of (3), that the hovertext ("Wait for it.") just doesn't fit with a tragic comic. It's far too heavy-handed for Randall. I think the April Fools' idea is a possibility, but I kind of hope that this isn't the case. I probably (read: definitely) am looking way too far into this, but it looks like the last few images have been drawn in a thicker, less refined line style similar to that of xkcd's earlier days, like, say, comic #96 (nothing special, just the first one I found with that style from randomly clicking through the archive). So that could mean either a) it's supposed to be some kind of nostalgic call-back to the past (which would make sense with what we see of the comic now) or b) he's only drawing these latest panels now (his strokes are going to be less accurate if he has to produce a new one every half hour). Or maybe it doesn't mean anything and I've overanalyzing it. Was 407f7e8766a75cc25389b7852cd9be4f3f29994eeb5c35f0f7d5656e186d4331.png the first image? I downloaded it at 8:10MST. Well, call me childish, but that makes sense. "Megan" was laying on her back while the bald guy was "sticking" "his foot" in "the water". And then something was created. What a lovable interpretation of people trying to reverse-engineer the hashes to get future frames before we are allowed to see them. I must admit: I can wait for the comic to complete (and watch the generated animation), but I can't keep myself from continuously reading about the advances within the community about the comic. I have to attend college in 7 hours and I should already be asleep, but the comments in this thread are too wonderful to ignore. thevicente wrote: Stick figure drawings, by definition, dont transmit much information. Neither does low framerate videos (of what this is kind of). It's true the comic does not contain much information (yet), but it does induce a lot of entropy (within the community) which is an equally good thing. Forbidden 403 wrote: I woke up from my sleep with the following realisation, and had to post it immediately; though I had started watching this strip with gloomy/morbid thoughts there is only one possible indication that this post is giving. Well, someone had mentioned that earlier, back when the guy was still milling around, but it seems even more likely now that they are making something together. At first, I also thought this strip seemed gloomy and ominous, but as time passed, and especially when they started building, I started to think it might not actually be as gloomy after all. IMHO, either you are right, or they leave and the castle gets washed away in a depressing metaphor for the passage of time. On a side note, if it is an announcement of that sort, I think the first frame will truly be gone for good. It seems likely to me at least that if there is an announcement, it will stay up on the page after this... whatever we are calling it (A video, I guess?) ends. zachbarnett wrote: I would add, in defense of (3), that the hovertext ("Wait for it.") just doesn't fit with a tragic comic. It's far too heavy-handed for Randall. "Wait for it" could also just mean: "this looks like a boring picture, but wait and something will happen" (even with that promise, this thread did start with some disappointment) But I agree it will probably not end because it's getting dark. (the movie we are watching is actually slower than real time).